Meryl Streep's latest is something of an oddity. It is difficult to see the sixty-six year-old, Academy Award-winning actress as a lover of 60's and 70's rock and roll who never gave up her dream of joining that world. It isn't that Streep can't pull it off (please, what can't she do? ), it's just a strange sight to behold and watch unfold. Decked out in gaudy jewelry from her ears to every finger and even more excessively around her neck, she is a nightmare for airport security. She swoops her thinning air to one side with the rest braided so as to elicit a steaming punk persona. She wears lots of black and a lot of leather and hates to go anywhere without her guitar. While the typically regal persona we see from Streep certainly doesn't correspond with what we see in Ricki there is something to be said for this unorganized, irresponsible and blatantly selfish person that chose one dream over another. Written by Diablo Cody (Juno, Young Adult) and directed by Jonathan Demme (The Silence of the Lambs, Philadelphia) Ricki and the Flash is more a movie about the state of the American family than it is one about a failed singer. The trailers would have you believe this is something of a slight piece of melodrama that would be just as (if not more) suitable for the Lifetime network than your local multiplex, but it's clear from the moment things get a little more intense concerning Ricki's daughter (Streep's real-life daughter, Mamie Gummer) that this isn't simply a familial drama with fun interludes of Streep singing classic rock. No, Ricki and the Flash is indeed a more subtle and intricate commentary on topics largely relatable to the casual audience member. Sure, you may could see the conventions that the film works within from a mile away, but the seasoned cast sells it and the inspired moments of writing in certain scenes combined with Demme's assured direction make for an enjoyable and rather affecting experience. Julie (Mamie Gummer) and her mother, Ricki (Meryl Streep), reconnect after Julie's husband leaves her. 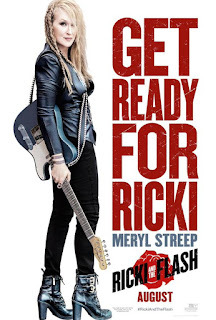 Streep's Ricki Randazzo is actually a failed rock and roll star rather than the seasoned vet one might have expected considering the marketing. 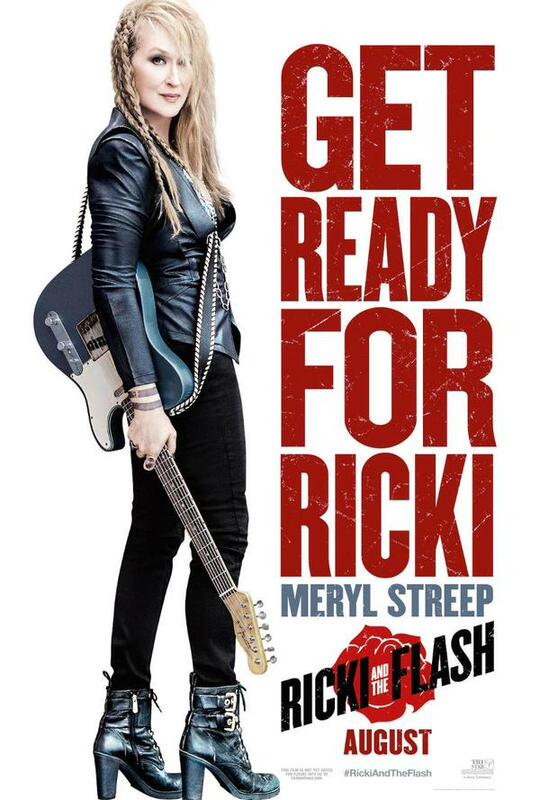 Unable to give up on her dream to make music for a living Ricki lives in Los Angeles and works at a grocery store during the day making just enough to pay her rent while maintaining the status as lead singer of The Flash, a house band at a local dive bar. While Ricki seems rather content in her world of being worshipped by the regular bar patrons and it's bartender (Pitch Perfect's Ben Platt) while at the same time hooking up with her lead guitarist Greg (Rick Springfield) it seems all is not well on the home front. Getting an unexpected call from her ex-husband Pete (Kevin Kline) concerning their daughter, Julie (Gummer), who is dealing with her husband leaving her for another woman, Pete asks Ricki if she might come home to help with the situation. While hesitant and barely able to afford the plane ticket, Ricki decides to take a chance and ultimately be there for her children whose lives she's already missed so much of. Once she arrives in Indiana, Ricki realizes the situation with Julie is worse than Pete initially let on. Julie is spiraling into a dark depression after attempting to commit suicide while Pete's new wife, Maureen (Audra McDonald), is away attending to her ailing father. Ricki and Pete have two other children together, sons Josh (Sebastian Stan) and Adam (Nick Westrate). Josh is currently the most open to the idea of allowing their mother back into their lives despite the fact he intended to keep his engagement to Emily (Hailey Gates) a secret while Julie only sees her as another person that abandoned her and Adam has a chip on his shoulder he can't seem to shake. What Ricki and the Flash isn't is a movie about a mom returning home to right all of her wrongs, but more a movie about a woman who is completely her own coming to terms with and admitting to mistakes she may have made in her past and accepting that she might actually change some things could she do it all over again. As the film began, I felt unsure of what I was getting into. It is admittedly tough for Streep to break through the barrier that this potentially embarrassing character carries with her. Watching a sixty year old (man or woman) strut around on stage at a local bar, singing songs we've all heard countless times before isn't just potentially embarrassing, but it takes skill to pull off without the audience cringing. About halfway through the first song I began to ease up, Demme's approach of making Ricki and her band feel right at home allowing me to feel the same. What came as a surprise was that I would come to feel more awkward when Ricki returned home. Hopefully she might break this barrier the same way she did with her stage presence I thought. We all know Meryl Streep is a great actor, someone who can inhabit any persona and convey the necessary emotion to allow us to become fully invested and dammit if she isn't just as strong here. Streep maneuvers her way back into the children's lives and makes us feel her Ricki is someone we all know, someone whose mentality we understand and have struggled with in our own lives. There is a particularly moving scene in which Ricki is dealing with the repercussions of her life choices, pondering what to do when she realizes she's royally screwed up and it's too late to fix it. Ricki has flown back to LA after consoling Julie and is performing when something of an existential crisis hits her. Should she have stayed home? Should she even be where she is at that moment? She could have let the hard-working Pete make their money that would have allowed her to now be living in a lush mansion instead of a crappy apartment with close ties to her children rather than the fractured ones that exist currently, but would the constant tugging of should she have chased her dream have been too much to bear? It's difficult because she recognizes were she a man her children would have likely idolized a father who was a musician and simply chased what his heart desired, but because she is their mother, because society assigns her the role of the inherent parent, the reliable and responsible one, she is looked at as a ruined person who ruins others. Ricki performs with her band, The Flash. And so, Ricki and the Flash is more about consequences than anything else. The consequences not only that Ricki has to face for choosing to live the way she did, but those that her family is forced to face. McDonald's Maureen is especially privy to the consequences Ricki's children had to deal with in light of their mother not being around for not just the milestones, but the small moments in between. Naturally, there are two sides to every story and in a particularly heated scene between Streep and McDonald tensions come to a head. It is in this scene we see through the way each woman argues and justifies their side to what the true story is. We know that Maureen saw the hurt in Julie, Adam and Josh's young faces and held some resentment towards Ricki while Ricki saw Maureen as nothing more than a woman keen on moving in on her family only further solidifying she couldn't have her cake and eat it too. It is easy to feel sorry for Ricki, that is what the movie wants us to feel, but as the film continued I also began to wonder what resolution it could possibly want for Ricki? We know that there would have to be some kind of renewed strength in the relationship between she and her children, that is clear, but how would she shut down the dream factory and move to Indiana permanently? It seems music is all Ricki has to give and thus she will forever be unable to give it up entirely and in many ways, she shouldn't have to-she should simply adapt. By the time the credits roll we can only hope that is what the future holds for Ricki and her clan. Cody's screenplay gives Ricki's arc considerable time and precious development as Demme and his editor efficiently pace their film while allowing the more weighted portions to be leveraged with a consistently funny tone. Adding to this interesting oddity of a Lifetime flick meshed with genuine emotion and authentic familial issues is the commentary on the state of children and how we over-analyze their behavior and diagnose them so quickly they aren't granted time to figure things out for themselves. And then there is the strongest statement the film makes in reference to our current societal outlook of not caring enough to work through or put in the effort to make things right and instead simply giving in to giving up. These themes are made abundantly clear through the performance of Gummer who, for the first half of the film, nearly steals the show from her legendary mother. Julie is more than blunt with everyone around her in the wake of her suicide attempt thus giving way to a lifetime of complicated family dynamics being brought to the table in a matter of days. This inevitably leads to more drama than one might be prepared to handle in that time frame, but it is measured just right for this hour and forty minute dramedy. 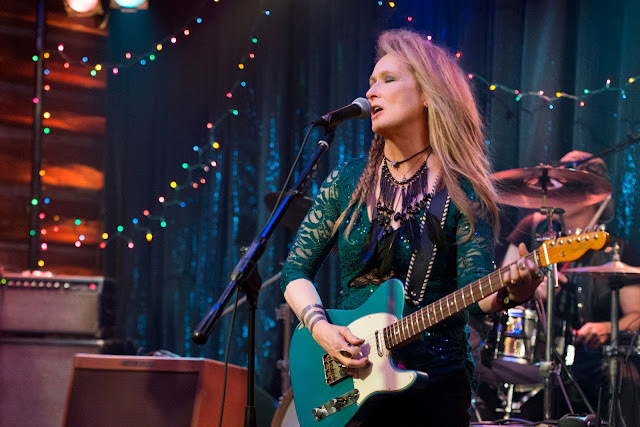 Ricki and the Flash supplies us with solid performances, complex insight and a fair amount of laughs to leave one both touched and immediately more conscious of their decisions and the effect they might have on those most important to them.